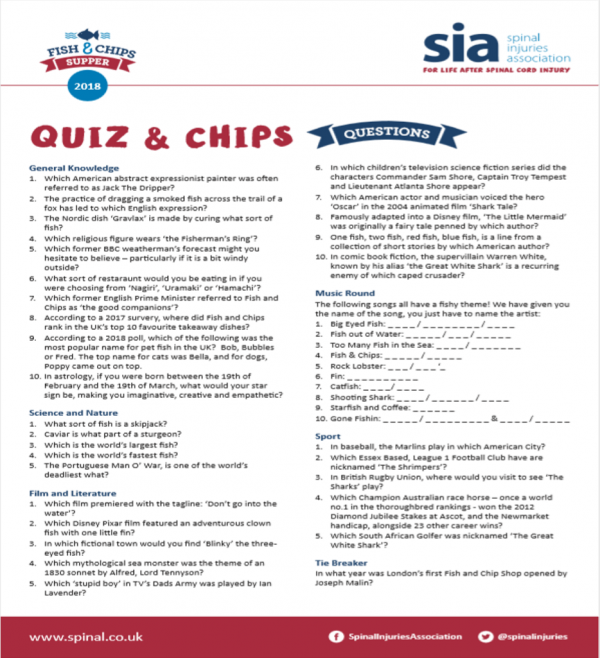 Join SIA and help us celebrate ten years of our Fish & Chips Supper on SCI Awareness Day 17 May. 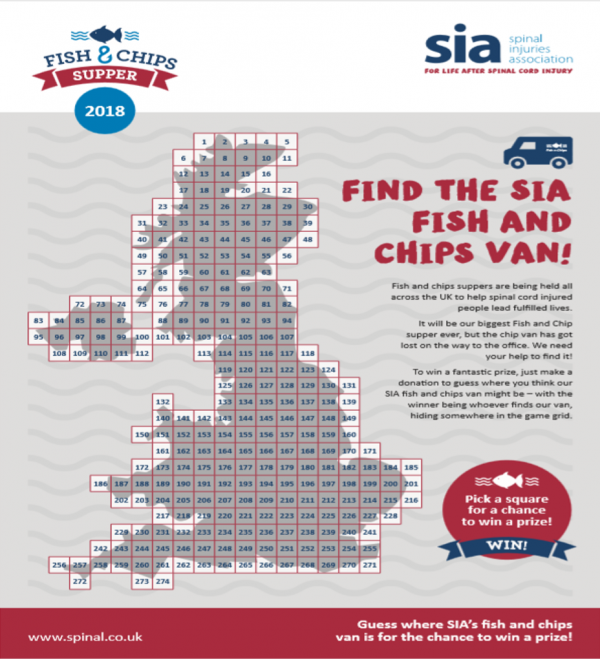 There is never a bad time to suggest a fish and chips supper: so no matter how you choose to take part, tuck in and help SIA make a massive difference. 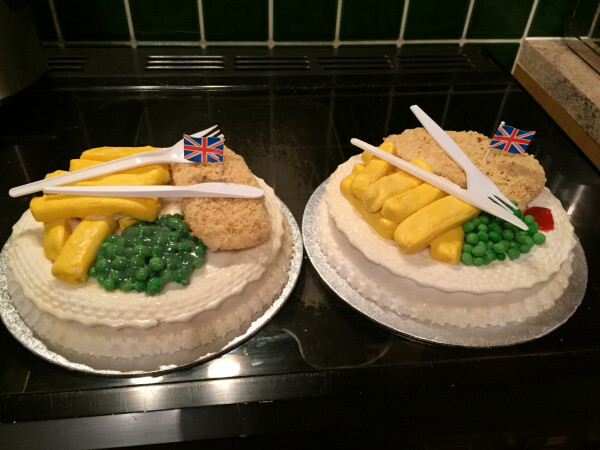 Building on the success of our ‘Great Big Fish & Chips Supper’ in 2018 we are once again encouraging all of our members and supporters to go crazy for cod, mad for mullet and potty for pilchards by hosting their own ‘fin-tastic fundraising events’ to support our work. 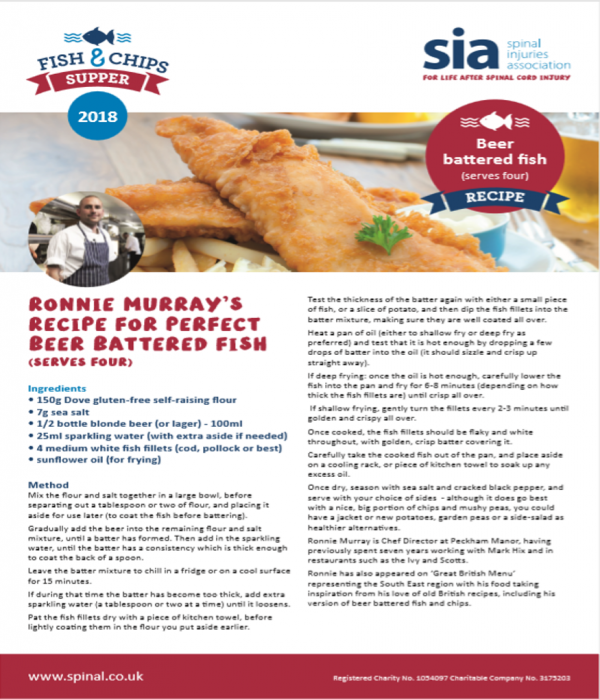 Whether you dust-off a secret recipe, or make a trip down to the local chippy, treat yourselves to a good old-fashioned meal, and suggest people make a small donation to SIA. Throw in a fish-themed movie to make the night complete, and relax with full stomachs knowing that every chip helped! 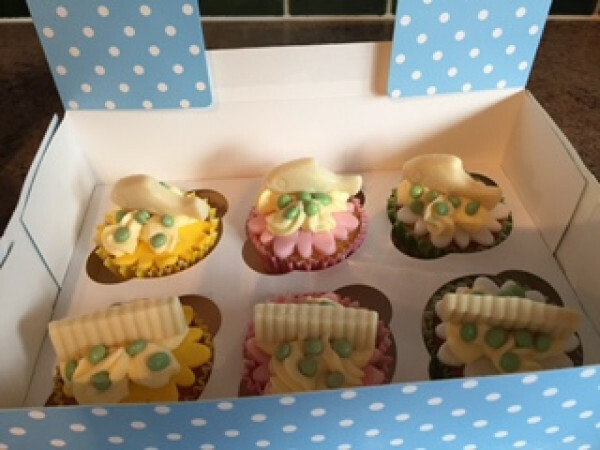 Invite friends or neighbours to really help your event make a splash! Get a bigger group of your friends, teammates or club members together, or suggest an office lunch. Add in some extra ideas from our fundraising pack to have an event which goes swimmingly: whether it is a fish-themed quiz, nautical fancy dress party, or even a sponsored challenge. Either sell tickets to an event, ask people to top up their order with a donation, or get people taking part in guessing games, or competitions to win a prize, and you should soon have a pot of gold for SIA that any pirate would be envious of! Help put SIA on the map, near you! 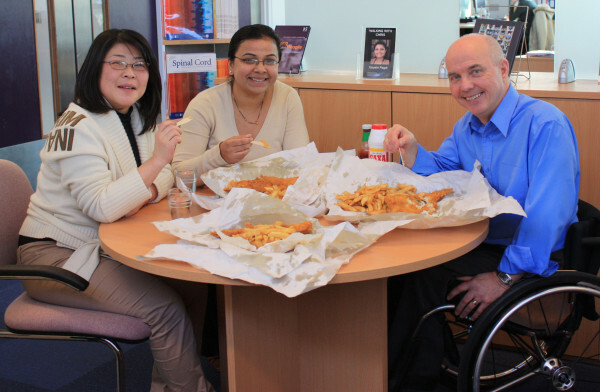 Raise awareness of spinal cord injury, and how we support people in your community by asking your local chip shop, pub or restaurant to get involved: the worst they can say is no! We can provide you with a letter of support, and everything you need to make a case: all we need from you is the help to find those amazing people out there willing to get on board, and help make fish and chips really be food for thought! 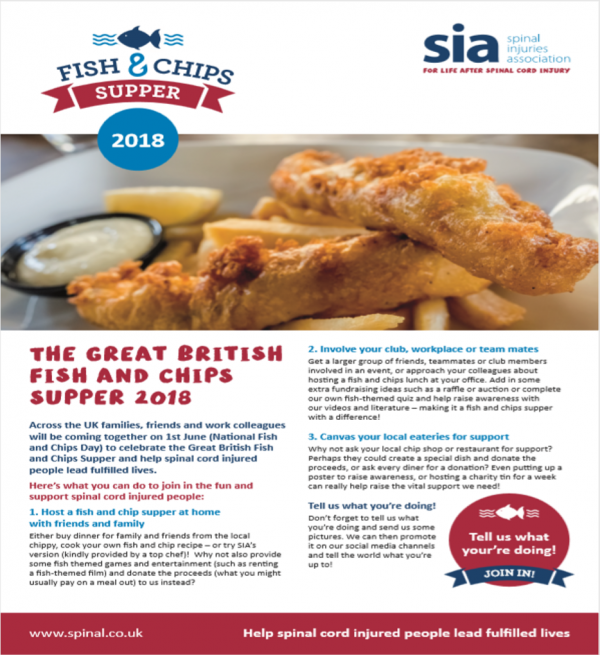 Ask your local chippy if they will put up some posters on 17 May, ask customers for a donation on that day, or even just host one of our SIA collection tins for a week or two. And why not see if your local pub or restaurant can get behind us, either with an event of their own, or by creating a special dish (with proceeds going to SIA). We will be following all your efforts on social media too, so make sure to send in your photos and messages, and we will be happy to share them with everyone else to show how you are really making the batter matter for SIA! To request a fundraising pack, you can call our fundraising team on: 01908 208 541, email us, or, fill in your details in the form below. Our pack includes everything you will need to make your evening a success, including some invitation cards, fish and chips posters, sponsorship forms, donation envelopes, balloons and our ‘how we help’ leaflets, and for bigger events, we can send you everything you need to host a quiz, organize raffles and much, much more. 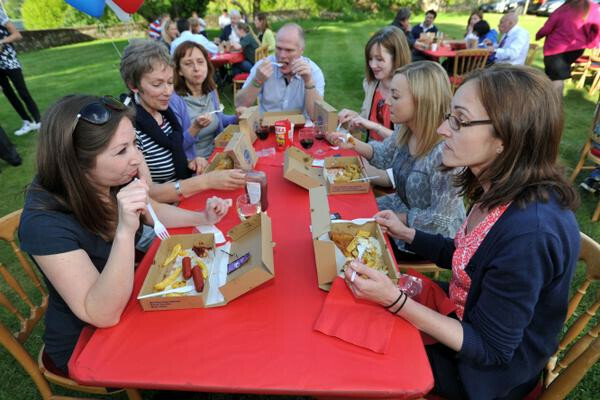 If you can’t join us on 17 May, dont worry, as people will be holding fish and chip suppers all around the country throughout the year! We don’t know about you but after reading this we are definitely going to the chippy today… hopefully we will see you there! Would you like us to provide extra fundraising materials (balloons, flags, posters etc.)? Upon submitting your form a member of our fundraising team will aim to contact you and arrange for your fundraising pack to be sent out as soon as possible. However, if you have any questions or an issue arises in the meantime, please do either phone or email us and we will be very happy to help.